A promising new adhesive material was born out of a scrap. David Christensen, a mechanical engineering graduate student at Stanford, was trimming a piece of adhesive modeled after the grippy fingers of geckos, and noticed that the thin scrap seemed particularly grippy. He shared this observation with his colleague Elliot Hawkes, who laminated a piece of non-stretchable, but very flexible, film to the back of the scrap. They found that the combination greatly magnified the grip, and also allowed some surprising properties. "The first time we played with the composite, it was clear the material grabbed onto textures that we were never able to grip before, but doesn't remain stuck," said Christensen, who is advised by Mark Cutkosky, a professor of mechanical engineering. They shared the material with a fellow graduate student, Hao Jiang, and they immediately realized that its ability to grip tightly to any textured surface, yet also release without effort, would make it ideal for a robotic grabber they were working on. The trio collaborated with others in Cutkosky's lab and ultimately designed a gripping mechanism that is able to pick up objects of many sizes, shapes or textures – from trash bins to balloons to burritos – without having to squeeze them. Hawkes is presenting the work at the IEEE International Conference on Robotics and Automation, held this week in Seattle, where the project has been nominated for both the Best Student Paper and Best Paper awards. "What makes this gripper different is that it doesn't need to squeeze objects to pick them up, since the material grips without pressing it into the surface," Hawkes said. It's the first such system that does not rely on any sort of pressing force (like a person grabbing with a hand) or pulling force (like a suction cup or sticky tape). It manages this by borrowing its design from Mother Nature. The students and Cutkosky focus on designing materials that mimic the tiny hairs on gecko toes, the incredible physics of which allow the animals to crawl on almost any surface. In this case, the underside of the fabricated material consists of thousands of tiny hairs, each only 100 microns long. When the hairs stand upright, they make contact with objects, but don't grab onto them. As the mechanism tugs on the film-like material, however, it wraps around the object, and the hairs flatten and touch the object. Altogether, the hairs exert a tremendous gripping force on the object. But simply release the tension on the film, and the hairs stand up again, making the material non-sticky and releasing the object. "You can think of it basically like gripping with 'super friction' that's so strong that you don't need to actually squeeze to get friction," Christensen said. The tiny hairs allow the gripper to conform to the nooks and crannies of bumpy surfaces, or to fit snuggly against smooth ones. 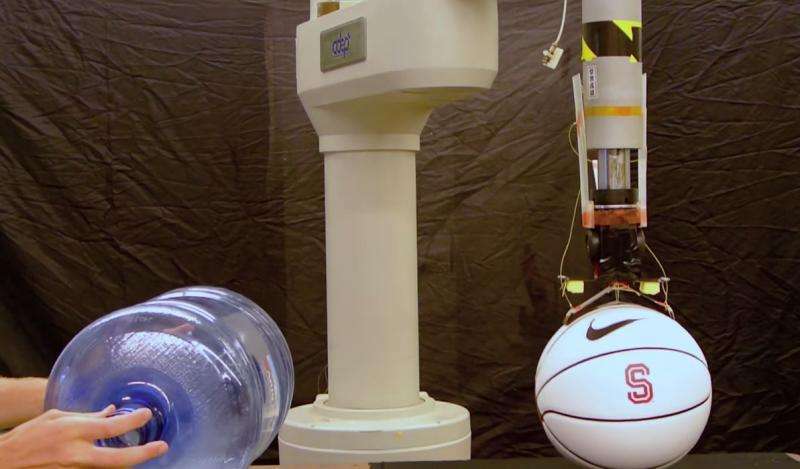 The team has tested hand-size versions of the grabber on objects varying from telephone receivers to water-filled bags, large pipes, footballs and basketballs. It can easily handle objects weighing several pounds, but Jiang said that the physics of the system suggest that a larger gripper would be able to grab larger objects. "Seeing this material in action is really surprising." Hawkes said. "Using a glove with this material, a child could palm a basketball, but could still toss an air-filled balloon without having it stick. It's super-grippy, but not sticky at all." The group now aims to build the material into a more complete robotic hand. The members anticipate a wide range of applications – including prosthetics, around-the-home robotics or even industrial uses ­– and plan a particular focus on handling delicate objects. Pretty amazing. For the single gripper it seems to be limited to convex objects. But if one were to apply this to several fingers of a robot then one could conceivably also grip concave objects. The full passivity should be enormousley interesting for any number of industrial applications. Seems to me that release is going to be a big problem. Reducing the force to zero so that the hairs recede is not going to be easy in general.